SendPulse is a comprehensive email marketing automation solution that provides users with a richer set of tools and capabilities that other email marketing software systems offer. From a centralized location, users are able to plan their campaigns, gather and segment their target audience, run A/B Tests, launch marketing campaigns through web push notification, emails and text messages, track them from a mobile app, and analyze the performance per campaign to gather highly actionable insights. SendPulse is an extremely user-friendly marketing application, making it a very attractive tool even for novice users. 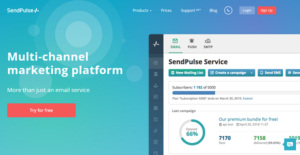 Integrations with leading CRM, CMS, and e-commerce systems allow SendPulse to further extend its functionality, delivering a highly sophisticated email marketing platform for the modern professional marketers and firms. SendPulse comes with a very robust set of tools and features that are not offered by many of today’s email marketing platforms. Even with an impressive feature set, using SendPulse to fuel your email marketing campaigns is not difficult. It designed to be intuitive, enabling even the most novice of users to fully maximize the software’s potential to boost their marketing effort and yield great results. From a single location, you can perform every email marketing-related tasks without having to switch to a different platform. You can create campaigns and follow their progress, automate your entire marketing cycle, and analyze your audience to know which ones will be receptive to your campaigns and perform your desired actions. For a marketing campaign to be successful, it needs to tell the right message to the right audience. SendPulse helps you achieve this with its audience segmentation and A/B testing capabilities. The software comes with powerful segmentation tools that let you categorize your audience based on multiple factors such as age, gender, location, profession, industry, and more. It also helps you to know when is the best time to send them your marketing materials so that they are receptive and more than willing to engage. Your message is as critical as the type of audience you are targeting. A/B Testing allows you to experiment in which campaigns will resonate with your audience and likely result in success. Tweak your campaigns based on insights derived from analyzing your audience and get your marketing campaigns going with confidence. Since each organization has particular business requirements, it is sensible for them to desist from looking for a one-size-fits-all faultless software system. Needless to say, it would be pointless to try to find such a platform even among popular software platforms. The smart thing to do would be to catalog the various essential aspects that require consideration such as required features, budget, skill levels of staff members, company size etc. Then, you should do your homework thoroughly. Read some SendPulse reviews and check out each of the other systems in your shortlist in detail. Such exhaustive research can make certain you reject ill-fitting systems and zero in on the system that provides all the elements you need for business success. How Much Does SendPulse Cost? SendPulse offers a flexible enterprise pricing scheme based on the number of subscribers with a free plan for businesses with 1 to 2,500 subscribers. Contact SendPulse for more information. We realize that when you make a decision to buy Email Marketing Software it’s important not only to see how experts evaluate it in their reviews, but also to find out if the real people and companies that buy it are actually satisfied with the product. That’s why we’ve created our behavior-based Customer Satisfaction Algorithm™ that gathers customer reviews, comments and SendPulse reviews across a wide range of social media sites. The data is then presented in an easy to digest form showing how many people had positive and negative experience with SendPulse. With that information at hand you should be equipped to make an informed buying decision that you won’t regret. What are SendPulse pricing details? What integrations are available for SendPulse? You get to be told random excuses when they don’t like what you’re sending to your customers! If you need more information about SendPulse or you simply have a question let us know what you need and we’ll forward your request directly to the vendor.